Chief justice has decided yesterday to inquire into the fundamental rights petition filed against the special notification issued to dissolve parliament by President Maithripala Sirisena under a seven-member bench of judges. The chief justice has arrived at this decision by taking into consideration the motion filed before Supreme Court by leader of Podu Jana Peramuna Mr. G.L. Pieris and five others for the said inquiry be conducted under a fully-fledged bench comprising more than 5 judges. 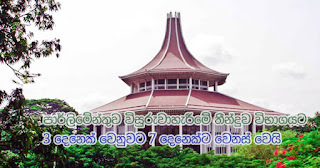 According to the fundamental rights petition filed against dissolving parliament by President Maithripala Sirisena, a bench of judges comprising Chief Justice Nalin Perera, Buvaneka Aluvihare, Sisira de Abrew, Prasanna Jayawardena, Priyantha Jayawardena, Vijitha Malagoda, Mudi Fernando of Supreme Court will be hearing the case next month 4th, 5th and 6th. Professor G.L. Pieris, Messrs. Minister Udaya Gammanpila, Wllawattage Jagath, Professor Channa Jayasumana and Attorney-at-Law Premanath Dolawatta have filed fundamental rights petitions against the special gazette to dissolve parliament by President Maithripala Sirisena to be heard under a fully-fledged bench of judges comprising 5 or more judges of Supreme Court in this court case. The intermediary petitioners had pointed out motions forwarded by them saying that it would be suitable to attend to this case under this procedure by 5 judges or more because of this reason. It is also mentioned in the motion that under 132 of the constitution they request for a 5 member or fuller bench of judges. The petition was forwarded by 13 persons including United National Party, Tamil National Alliance, Janatha Vimukthi Peramuna, All Ceylon Makkal Congress, former MP Mr. Mano Ganeshan, Vikalpa Prathipatthi Kendraya, Attorney-at-Law Aruni Laksiri and member of parliament of Sri Lanka Elections Commission Professor Rathjeevan Hoole ... challenging dissolvement of parliament by President. An intervention order was released by Supreme Court last 13th prohibiting President in implementing the gazette of in dissolving parliament who granted permission.